Q – As a woman, you do not enjoy equal rights with men in Kurdistan. Nevertheless, you have dedicated your life to the liberation of the country. How did you come to this decision? A – It was in the early 1970’s, after the latest wave of the Kurdish liberation movement had been defeated. Following the defeat, a new resistance movement began to take shape, particularly in the Suleymaniyah area, with the formation of the Patriotic Union of Kurdistan (PUK). In order to reorganise the people in the countryside, the PUK sent partisans to villages. At the time, two partisans came to our village to form the village committee. They had set out to wage armed resistance against the Iraqi dictatorship and occupation, but they had very little resources. They were outmatched by the enemy in all regards but especially in terms of weapons. And yet they were ready to sacrifice themselves in defence of their country and beliefs. The partisans were extraordinarily knowledgeable and, anytime I had the chance, I would listen to them very attentively. I was very young then, around 14. But I was fascinated by them. I believed in their ideals. And more importantly, thanks to those partisans, I understood my duty as an individual in our occupied country. My father had already joined the partisans and I wanted to follow him. And, in fact, I did. Initially, I helped them as a courier. I delivered messages and materials between various points. It was an extremely dangerous affair, of course. But I was a little girl and I attracted less suspicion. At some point, the enemy destroyed our village, just like they had done to so many other villages at the time. The enemy always had some excuse for destroying the villages and displacing the people. In our case, the excuse was that there was no school in our village and that we had to be displaced to another location. Iraqi military forces moved us to a place built especially for displaced villagers. This one was called Askary. I remained active there as well, always trying to organise the women and encourage them to be more conscious of our duties to our land. I did not see any differences between women and men. That was why I wanted to join the Kurdish fighters and become one of them. Unfortunately, they did not let me carry arms. At the time, it was almost impossible for a young girl to join the military. I married a Peshmerga fighter and went to the mountains with him. There, I spent all my time with Peshmerga forces, helping them in any way I could. We shared the same destiny there, men and women. We were all living in danger, facing death because of what we believed in. We never doubted or regretted what we did. Q – In Kurdish society, when a woman such as yourself risks her life for what she believes in and is proud of her actions, she is said to be as strong and brave as a man. What do you think of this aspect of our culture? A – This makes me very sad indeed. When these qualities are ascribed solely to men, it does seem to me like violence perpetuated by our culture against women. Bravery, dedication, strength, resilience, and loyalty are also manifest in women. In fact, there are countless men who are cowards, liars, and traitors in every sense. It is necessary to recognise these qualities as human qualities, manifest in both men and women. 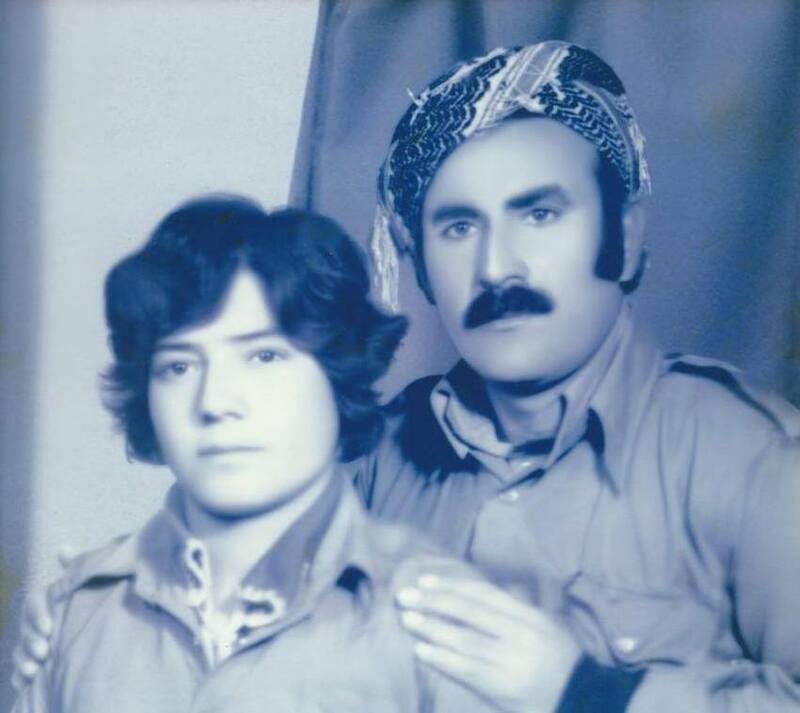 Q – When you joined the partisans, you wore the Kurdish fighters’ uniform, which is typically worn by men. What do you think of this? A – It is true that women in the military wear men’s clothing. In our case, the main reason for wearing this uniform was for its comfort and colour. The Peshmerga uniform is a khaki colour, which is very similar to the colour of the soil in our region. This is obviously necessary for camouflage purposes. Moreover, it is impossibly impractical to wear typical womenswear in the mountains while fighting. Again, for camouflage purposes, it is impractical to decorate your clothing with different colours. I would like to add that this was the uniform for the Peshmerga in Kurdistan. Just like the police uniform, there is no distinction made gender-wise. The only distinction is a slight modification to the collars of the women’s Peshmerga uniform.